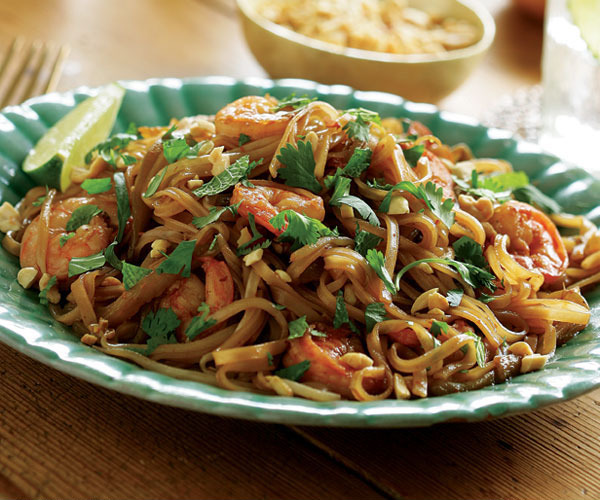 The method in this tasty pad thai is dead simple. You don’t need a super high-powered wok burner; you don’t even need a wok. And even though Thai noodle dishes in restaurants often include hard-to-find ingredients like bamboo shoots or Thai basil, you won’t need them here; your local supermarket should have everything you need. Submerge wide (pad thai) rice noodles in a bowl of very warm (110°F) water and soak until they’re pliable but still rather firm, about 20 minutes. Meanwhile, prep the rest of the ingredients. Drain the noodles in a colander (no need to pat dry). In a small bowl, combine the fish sauce, sugar, soy sauce, hoisin sauce, and chile-garlic sauce. 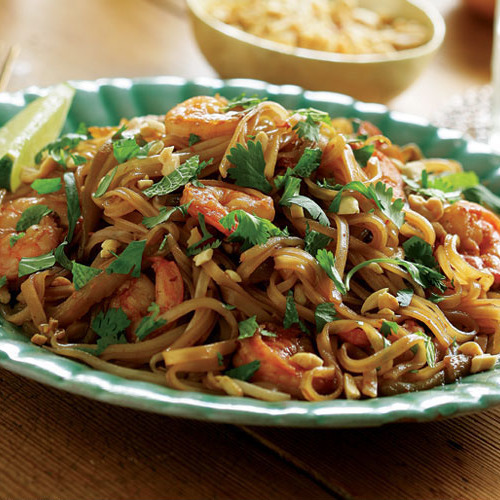 Once the noodles are drained, heat the oil in a large (12-inch) skillet or stir-fry pan over high heat until very hot. Add the garlic, stir, and immediately add the shrimp. Stir-fry until the shrimp turn pink and firm, 2 to 3 minutes. Add the fish sauce mixture. Stir to mix for about 20 seconds, then add the chile slivers and the noodles. Stir-fry until the noodles are tender and the liquid is absorbed, 1 to 2 minutes. If the noodles are too firm, add 1 Tbs. of water and cook another minute. Add the bean sprouts and stir-fry until they’re slightly limp, 1 to 2 min. Transfer to a serving platter or individual plates, and garnish with the peanuts, cilantro, and mint. Serve immediately, with lime wedges on the side. Serve with a Honeydew-Cucumber Shake for dessert. It was easy and the flavors are there but way too salty. Maybe it's the large amount of fish sauce? Ugh I couldn't get through it all for the saltiness. Much too sweet. 2 tablespoons of sugar? Plus sweetness of Hoisin sauce? Wow.If I did make it again, I would cut sugar by 50%. Super easy, great recipe. I added one diced red pepper for some colour and I didn't have any chili garlic sauce so added a touch of sirichai hot sauce, turned out great.